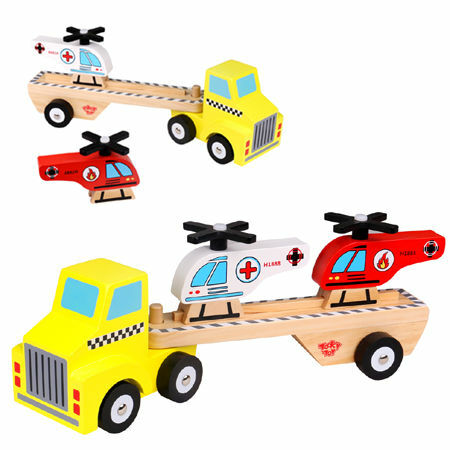 Helicopter Carrier Truck Wooden is a fantastic wooden transporter with two emergency response helicopters. This strong wooden carrier is removable from the yellow cab and a raised rail down the centre helps keep the removable helicopters in place. This is a great toy to ignite the imagination and will spark many rescue missions in your living room. This transporter set comes with a fire fighting helicopter and an ambulance rescue helicopter. We like this because: "Strong and fantastic for imaginative play."